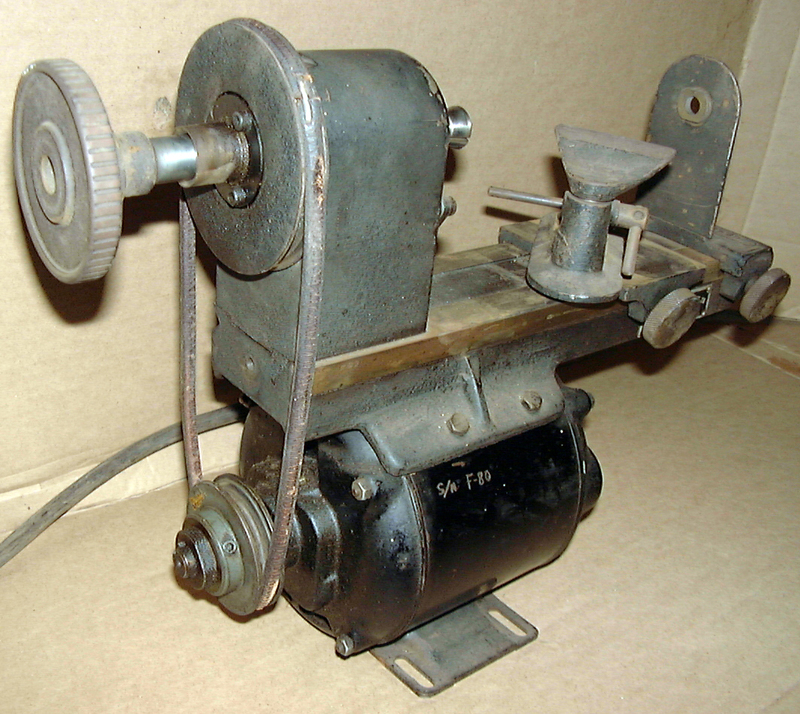 Very little nothing is known about this little collet lathe and unusual motor mount. The only clue is the label, which has the words "Sperry T44012" along the bottom. 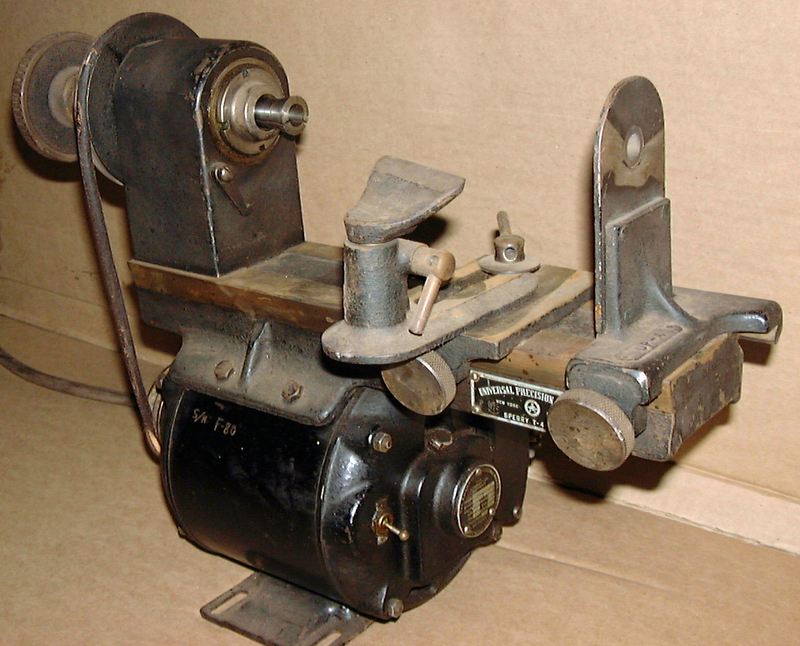 Of very high-quality construction, other examples have been found with a crackle-black finish, this indicating a machine constructed from the late 1930s onwards and intended for some specialist, technical task. Established by Dr. Elmer Sperry in 1910, the Sperry Company was became famous for the gyroscopes and other devices connected with ship and aircraft navigation. 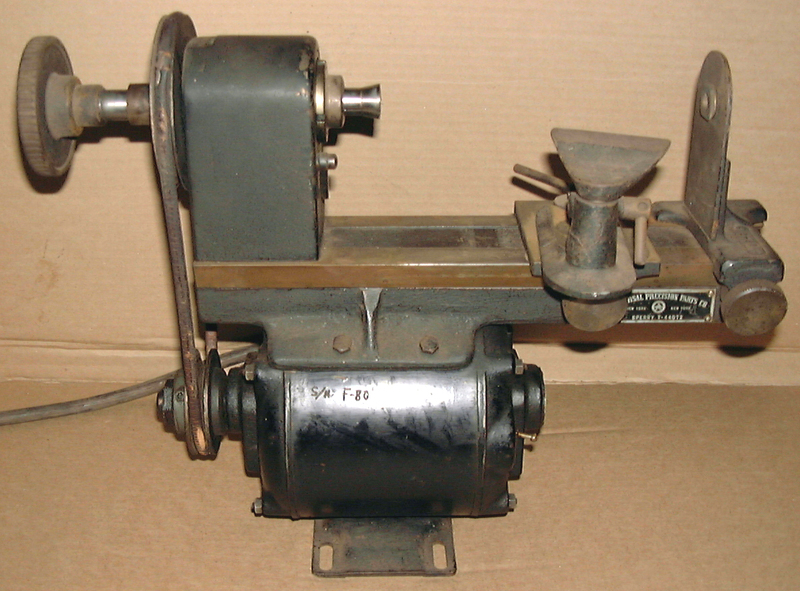 All the company's test and calibration equipment was labelled with a part number comprising a prefix "T" followed by a number and this "lathe", labelled as a "Sperry T 44012". Honeywell bought Sperry many years ago and a recent search by a Honeywell employee through the Company's older microfilm and test-fixture data base, together with conversations with other employees, drew a blank on further details; however, the item can certainly be dated, by its appearance and the relatively short serial number, to be of pre 1950 origin, and probably much earlier. The purpose of its original function is another matter; however, during World War 2 Sperry produced bomb sites, autopilots, gyrocompasses, etc., at its works in Long Island, New York. These instruments would have contained a steel or copper rotor suspended in die-cast magnesium gimbals - much the same construction continues today in gyros fitted to light aircraft. The right-angle "tailstock/steady" at the end of the lathe bed closely resembles the attachments still used to hold the ball races on the end of the gimbal spindles, rather in the way that bench centres can be used to hold a balancing rig, and it is possible that this bracket was used to hold a bearing on which the end of an item to be machined (or tested) could spin. Should any reader be able to enlighten the writer further, he would be very interested to hear from you.